The AJ Foyt Coyote Edition is built by custom car builder Heritage Customs out of Arlington, Texas and limited to just 500 units for 2007. The Coyote Edition includes a full body kit, special 20 inch chrome F18 wheels with Toyo tires, center fog lights, and a chrome billet fuel door. Optional Coyote options include a suspension upgrade, 4.10 gears, and a supercharger! 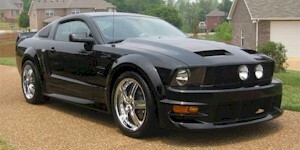 This is a black 2007 Mustang AJ Foyt Coyote Edition coupe. This one is serial number 6 out of a quantity of 500 units built. It is built by custom car builder Heritage Customs out of Arlington, Texas. The Coyote Edition includes a full body kit, special 20 inch chrome F18 wheels with Toyo tires, center fog lights, and a chrome billet fuel door.